A Vast World That Exists Inside Every Item! The Farther You Travel Inside, the Better Your Weapons Become! In the Netherworld, where anything is possible, it's not too strange for there to be worlds within items! 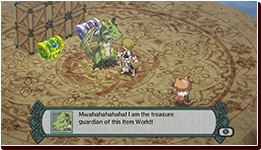 These worlds that are inside of items are called Item Worlds, and Laharl and company can travel to them! 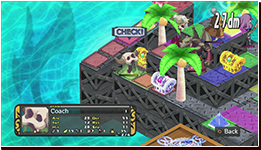 The Item World is full of islands (floors) where the residents of the Item World live! Fight the residents to take over their islands. 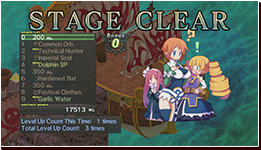 The more islands that you clear, the more your item will improve! Off to the Item World! 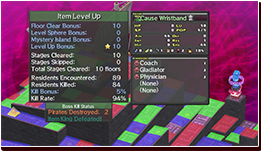 The Item World can be accessed from the Overlord's Castle. As long as it is an item, whether it is a healing item or whatever, it will have a world inside it. However, be careful when going to the Item World of a high ranked item. The stronger the item is, the stronger the residents of the Item World will be. You travel through the Item World on a ship! There are many types of ships, and the better your ship, the deeper into the items you can go. 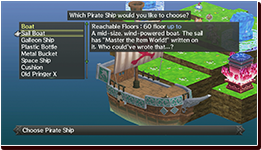 You will be able to get more ships as the game progresses, so find a ship you like! Item World Maps are Unique! These maps can be really bumpy, and objects can be found throughout them that are based off the item. There are also a lot of Geo Panels and Geo Symbols. Also, the deeper you go into the Item World, the stronger the enemies will get. Conquering the Item World will not be an easy task! 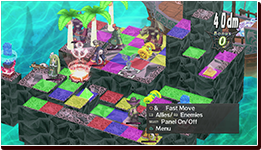 Clear Floors and Defeat Bosses to Increase the Item's Stats! The stats of the item will change depending on the number of islands traveled, as well as the number of bosses defeated! 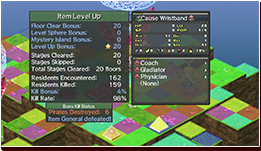 Defeating the large bosses that inhabit the Item World will greatly increase the stats of the item! 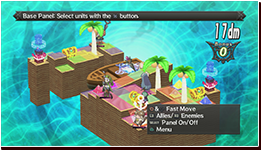 Travel the islands and defeat the enemies! To leave the Item World, you'll need to go 10 floors or use a special item! Out of the Item World! The item's stats will increase as soon as you leave the Item World. The Results of Your Adventure = Stat Increases for Your Weapon The more you accomplish on your adventure, the bigger effect it will have on your item! Travel to many Item Worlds and get the strongest weapons! The Many Appeals of the Item World! 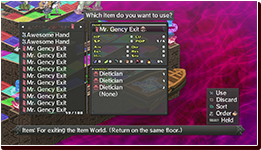 The main focus of the Item World is to strengthen items, but it has much more to offer. And we'll tell you all about that right now! Rare Items! The Item Worlds of good items are dangerous because they have stronger enemies, but you can get very rare items in the Item World that you can't get anywhere else. Innocents! Innocents are the good residents of the Item World. They will not attack unless you get near them. If you subdue Innocents by defeating them, they will further strengthen your item. Although they may be "good" residents, as a demon, you should show them no mercy! Mystery Islands! When traveling the Item World, You will sometimes come across Mystery Islands. They can be anywhere! 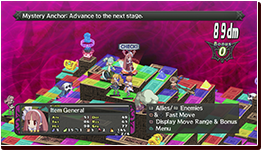 You might be able to get rare items or abilities to strengthen your units! Pirate Attacks! 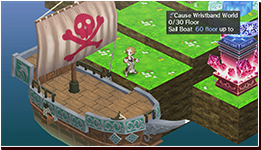 There are also Pirates in the Item World! 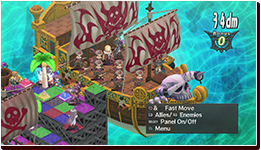 When battling the residents of the Netherworld, these pirates might show up out of nowhere! And, they are typically stronger than the normal residents!